By Gav Duthie: It has been over 30 years since the undisputed Cruiserweight champion Evander Holyfield decided to make his assault on the heavyweight division when he stopped James Tillis in 1988. He is the only ever truly successful fighter who has transitioned between the two divisions and now Ukrainian sensation Oleksandr Usyk plans to do the same. David Haye had some joy winning the WBA regular title in a truly David v Goliath battle beating 7 foot Russian Nikolay Valuev but the success was short lived when he faced Wladimir Klitschko. Why have only two cruiserweight fighters won gold at heavyweight in 30 years? Can Usyk emulate the great Evander Holyfield? What are the main obstacles to the transition? This article will hopefully give an in depth insight as to how good Usyk can be. It took Evander 18 fights to become undisputed champion of the world at Cruiserweight with Usyk doing it in 15. Evander picked up the WBA title in one of the greatest fights of all time against Dwight Muhammad Qawi, the IBF facing an over-matched Ricky Parkey and the WBC against Carlos De Leon (The WBO wasn’t created until later in 1988 when a splinter group left the WBA). Usyk’s progression was aided by the World boxing super series (WBSS) although he did pick up the WBO title against Krysztof Glowacki in only his 10th contest earlier. He added the WBC in the WBSS semi final against Meiries Breidis and the WBA and IBF over Russian Murat Gassiev in the final. 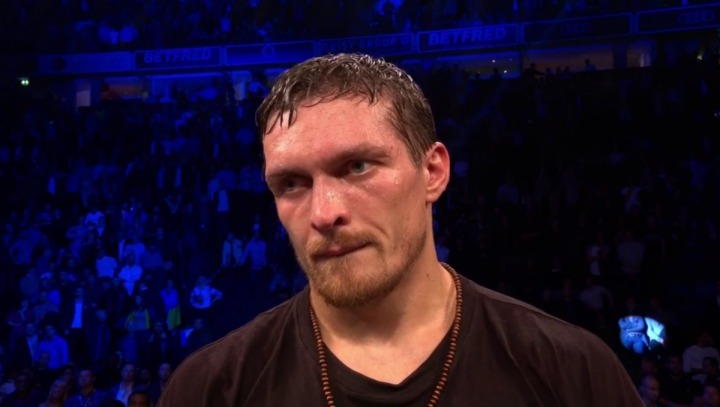 It has to be noted that the competition was much more fierce for Usyk. Saying that the 90s heavyweight scene is arguably better than now. Heavyweight Champions like Joe Louis, Rocky Marciano and Floyd Patterson would regularly weigh in at around 190 lbs. Today these fighters would probably be light heavyweights. By the 70s the likes of Muhammad Ali and George Foreman were in and around 220 lbs. It was deemed unfair for there to be such a disparity in weight between fighters so the Cruiserweight division was created as a buffer between light heavyweight and heavyweight. Its first champion was Marvin Camel in 1979. In 2011 the limit was raised from 190-200 lbs as once again the average heavyweight changed with them now weighs 240 lbs or above. For me this was the key to change. I believe Usyk will be a success at heavyweight. These Cruiserweights now are huge at roughly 6″3. They are slick as well and have better stamina than most heavyweights. The question is can they survive against the giants of the division. Although David Haye is the only champion since the turn of the century dawning from cruiserweight there have been other attempts. Juan Carlos Gomez had a title shot against Vitaly Klitschko, Jean Marc Mormeck against Wladimir and Marco Huck was unlucky not to get the decision against Alexander Povetkin. Just at the back end of 2018 Michael Hunter added two contenders to this list with knockout victories over Martin Bakole and Alexander Ustinov. Hunters success leads me to believe that Usyk will do very well at heavyweight. He is just as tall as the likes of Alexander Povetkin, Dillian Whyte, Jarrell ‘Big Baby’ Miller and Joseph Parker but his skills and mobility will be far superior. The main question for Usyk will be his power and ability to take a punch as he had a great chin as a cruiserweight. I think Usyk will be the beginning of many more two weight world champions between cruiserweight and heavyweight. The main reason is there is much more talent fighting at 200 lbs these days. There used to be no money or interest in cruiserweights so the good guys would rather fight as a 215 lb heavyweight and make more cash than cut weight to a less lucrative division. When the limit changed we saw the likes of Haye, Mormeck and Huck make the step up. As more eastern Europeans turn professional the standard of the division has increases and I believe the likes of Murat Gassiev, Briedis and Yunier Dorticos would do well also like Michael Hunter has. I would already tip Usyk to beat the likes of Whyte, Dereck Chisora, Miller, Kubrat Pulev and Joseph Parker. I think he dances rings round them. He can do 12 rounds at a frenetic pace and he will be faster with a better ring IQ than all of the aforementioned fighters. The big problem is that Usyk is the size of a Muhammad Ali or Evander Holyfield whilst Deontay Wilder is 6″7 (only 220 lbs though), AJ is 6″6 and Tyson Fury is 6″9. Usyk can easily match Tyson for footwork but can he reach him. Joshua will be bigger than him in every department and he will have never felt the power of anything like Wilder can throw. To be honest as good as he is I think his best bet is the WBA regular title against the likes of Manuel Charr or Fres Oquendo. Although David Haye managed to defy the odds and beat a 7 foot monster but Valuev has nothing on these champions today. Usyk has a chance and I think that there will be more cruiserweight come heavyweight champions in the future but I feel as good as he is he will fall just short of the elite fighters in the top table. Boxing » Aleksandr Usyk » How far can Oleksander Usyk go at heavyweight?